I’ve seen some of theses updates around too, in a perfect world though shouldn’t the card be able to work no matter what side you use? Or should they just put a magnetic strip on both sides of cards? Or even better, agree on a de-facto ‘rule’ for which way it goes? If it was always the same, we’d need less guidance! You don’t see the banks getting innovative and creative about how you insert your card in an ATM, or parking ticket processors, or any other card processor …. so why are EFTPOS terminals so inconsistent? 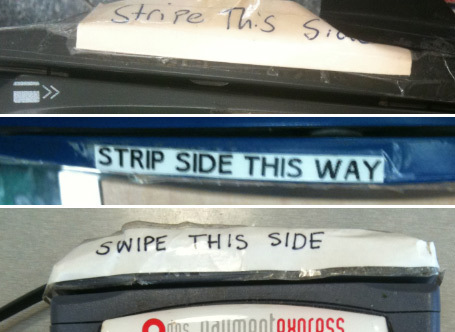 Yes, I always get it wrong and have seen the improvised stickers retrofitted to EFTPOS machines. Great article on everyday UX. It’s also interesting to see the way trails of wear and tear can tell us about how people interact with machines. I’ve seen these terminals where the number 1 and 9 are the most worn… apparently because many people use their birth year as their 4 digit code. Oh, this is great Nick. It makes you fell so dumb and you can just tell the people behind the till are sick of telling customers which way to do it. That stupid little card symbol would seem intuitive to the person who puts it on the machines, but it just isn’t. It induces classic user hesitation in even the brightest people. I’m with Alastair on this one though – why can’t they make the machines work anyway we swipe? BTW – CADMUS machines have always seemed well designed to me. Ironically i spent 5 minutes in one of the new self check outs at my local new world swiping my new credit card. Turning it around, checking the instructional icon and the my card. Thought i was going nuts. Turns out my new credit card has a chip and goes in a completely different slot altogether! WTF? I have a theory that we are conditioned by use of other scanning devices to believe the magnetic strip MUST face the machine for it to be able to read it. These terminals are designed so the strip faces away from the machine, which may be counter intuitive, challenging our understanding of how to interact with these things. Because of this the instructional message needs to work extra hard to re-train people’s expectations of how the machine works. It’s quite possible of course that I’m way off the mark… What do you think? I think cost is probably the only reason why they don’t work both ways. There is another great annoyance on this front that hasn’t been well covered (although Steve touched on it above) – and that is chip cards. But when you don’t, you swipe a few times, completely forgetting the whole chip thing, then some wizardry is needed on the eftpos terminal to make it read an inserted card, all while you’re standing there feeling like a douche. The nasty part is that because the rollout is incremental, there is no simple solution! Agreeing with the observation that the cards should be able to swipe either way. Is cost really a factor? If the strip was running down the centre of the card it wouldn’t matter, or if the card had two strips. Surely thats cheap, and reliable. Typically in electronics, component cost is 1/16 of the retail price, so a $1200 terminal may have $75 in parts, so whats the reader itself worth given the screen and nacelle etc? In a country that touts as being the EFTPOS capital of the world, used for 60% of purchases, and kiwis averaging 200 swipes each per annum, there is perhaps little excuse for the archaic boxes we interact with daily. And thats a challenge! Amen. Massive—and very public—UI fail. … and how hard would it really be to add GST number to the receipts? This would save a LOT of people asking for the separate receipt.